Encompassing over 7,600 islands, the Philippines offer plenty of vacation ideas for active travelers. Though the island chain's location leaves it vulnerable to typhoons and earthquakes, it also endows it with plenty of natural resources and biodiversity. For most visitors, a Philippines holiday includes outdoor adventures like kitesurfing, mountain trekking, spelunking, and volcano hiking. Those with a taste for something more relaxing can build a Philippines itinerary around beaches, local fiestas, and the island cuisine, which blends influences from around the world and serves up dishes at once sour, salty, and sweet. Mimaropa: Offering sprawling national parks, palm-shaded beaches, underwater treasures, World Heritage Sites, and wild safari experiences, the country's western province promises a laidback Philippines holiday. Visayas: The islands of this archipelago contain many of the top tourist attractions in Philippines, including cultural sights, natural wonders, and outstanding eateries. Luzon: One of the world's largest and most densely populated islands invites you to venture off the beaten path and discover jungles, mountain villages, active volcanoes, historic ruins, and lush nature parks. Mindanao: The Philippines' "Land of Promise" draws tourists with its pristine beaches, excellent surfing spots, traditional mountain villages, tropical jungles, and the nation's highest peak, home to the Philippine eagle. Boracay: Drawing beach-goers from around the world, this idyllic island boasts pristine white-sand beaches edged with resorts, guesthouses, and restaurants serving fresh seafood. Manila: Serving as a springboard to the country's various islands, the "Pearl of the Orient" offers many of its own attractions for your Philippines holiday, including gleaming skyscrapers, lush public parks, and national museums. Puerto Princesa: The "City in the Forest" represents a convenient place to stay when exploring local dive sites, traditional folk markets, secluded beaches, and remote islands. Cebu City: The "Queen City of the South," dotted with colonial Spanish architecture, historic temples, museums, and restaurants, invites you to explore the country's marine heritage. Vigan: Fusing influences from across Europe and Asia, one of the best-preserved Spanish colonial towns in the country and a World Heritage Site deserves to be included on a well-rounded Philippines itinerary. Baguio: Acting as a gateway to the mountainous region, the "Summer Capital of the Philippines" allows you to explore hill tribe cultures. Puerto Princesa Underground River: Voted one of the "New Seven Wonders of Nature," this World Heritage-listed underground river winds its way through a massive cave, home to a diverse wildlife. Intramuros: Encircled by heavily damaged defensive walls, one of the capital's oldest districts offers a glimpse into the nation's history on your Philippines vacation. 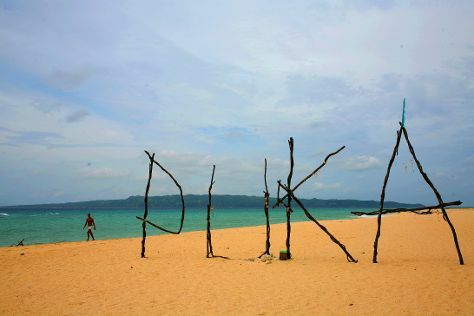 Yapak Beach (Puka Shell Beach): One of country's most valuable ecological treasures, this tropical beach lures you into snorkeling and exploring the area's underwater natural beauty. Chocolate Hills: Featured on the provincial flag, this photogenic landscape of scattered cone-shaped mounds represents a symbol of natural abundance and wealth. Honda Bay: Serving as a hub of commercial fishing and water sports, this exotic bay provides an ideal for kicking back on the warm sand and enjoying local seafood dishes. Alona Beach: Surrounded by hotels, bars, and restaurants, this powdery white beach popular with snorkelers and scuba divers offers access to several top Philippines tourist attractions, including a tarsier sanctuary and a naturally lighted cave. Taal Volcano: One of the Philippines' smallest yet most active volcanoes boasts a swimmable freshwater lake inside its caldera, surrounded by over 40 overlapping cones and craters. Kayangan Lake: Surrounded by hills, one of the cleanest lakes in Asia remains an ideal spot for relaxing, taking ferry rides, or swimming in a soothing natural environment. Rizal Park: Commemorating a Philippine national hero, this park overlooks the Manila Bay and contains many recreational, cultural, and educational facilities. The Philippines represents the perfect destination for a family vacation for many reasons--pristine nature, a wide array of modern comforts, delicious seafood, and tourist-friendly, kids-loving residents who often speak English. Home to luxurious resorts, islands such as Boracay and Palawan offer a fair share of water sports, rock climbing, and island-hopping opportunities. To add a few more natural wonders to your Philippines itinerary, visit Bohol Island, home to wide-eyed tarsiers, something of a mascot for the island, and a conservation center for butterflies. If your kids can't get enough of adrenaline-inducing sports, head to Mactan Island, where you and your young traveling companions can go snuba diving (a cross between scuba and snorkeling). Apart from cultural and historic sites, the densely populated cities of Manila and Cebu provide modern entertainment options, such as theme parks, zoos, and interactive museums. To make your sightseeing in Manila more exciting, take your kids on Segway or horse-drawn carriage tours through the urban areas. Beautiful white-sand beaches remain major tourist attractions in Philippines, popular with both solo travelers and those visiting with kids. The clear waters of White Beach and Yapak Beach provide perfect swimming and snorkeling opportunities. If you'd rather escape the crowds, go to Diniwid Beach. Thrill seekers shouldn't miss Enchanted Kingdom, a 17-hectare (41-acre) theme park with seven themed zones, or DreamPlay by DreamWorks, an interactive paradise where kids get to build their own dragon. To add a little intellectual stimulation to you vacation, take your family to The Mind Museum, home to five themed galleries, or Museo Pambata, filled with hands-on exhibits. Most kids will love exploring the old ramparts of Intramuros. The nearby Fort Santiago also offers a glimpse into the nation's history within in a lovely, well-manicured garden with a water fountain for the kids to splash in. At Art in Island you can create some hilarious photos and memories to take home from your Philippines vacation. The Philippine hospitality industry has been growing over the years, but even though all-inclusive, family-friendly resorts remain the smartest choice when traveling with children, you shouldn't miss out on everything else this beautiful country has to offer. Ask your hotel receptionist for a dependable tour guide who can organize daily trips outside the resort, but stick to the tourist-safe zones. Many local hotels offer onsite family rooms and will even provide cots--all you have to do is ask. As for dining out--feel free to take the kids with you anywhere you go, or look for restaurants that provide high chairs and kids' menus. The mouthwatering Filipino cuisine is one of the country's major tourist draws. Filipino style of cooking and its delicious food, characteristic for the surprisingly pleasing mixture of sweet, sour, and salty, developed under numerous influences. Filipino dishes range from very simple to extremely elaborate specialties that incorporate elements of Indian, Malay-Indonesian, Spanish, Chinese, Japanese, and American cuisines. The staple food is the same as in other East Asian countries--rice served with meat, fish, or vegetables. You might be surprised, though, to see that the locals don't eat with chopsticks but with Western-style utensils, if not with their hands (which is the traditional way). If you build the appetite for spiced or chili-hot dishes on your Philippines holiday, head to Bicol Region. In the southern part of Palawan Island, you'll encounter spices common to Southeast Asia, like turmeric and coriander, while the cuisine of Sulu Archipelago resembles the rich and spicy Thai and Malay-Indonesian cooking. Cebu City is known for its special way of preparing lechon, a popular festive food, which consists of a roasted suckling pig or calve. Roxas City, on the other hand, is considered the "Seafood Capital of the Philippines." The rugged Ilocos Region is renowned for its fruit and vegetables, especially strawberries. If you have a sweet tooth, consider visiting Cainta for a sampling of its fine rice cakes and puddings. In a country that boasts some of the largest shopping malls in the world, it is no surprise that a trip to Philippines offers an ultimate shopping experience. In upscale shopping centers of Manila and Davao City you can find the best deals on designer clothes, shoes, accessories, and leather goods. Designer boutiques remain top shopping spots in Cebu City, but you should also look out for local craft items, such as the capiz shell lampshades and handmade guitars. For a more authentic shopping experience, visit Salcedo Saturday Market or Divisoria Market, where you can browse through a wide selection of handcrafted ornaments, kitchenware, specialty foods, and other knickknacks. Filipinos are very friendly towards foreigners--they might even seem submissive to Caucasians--but that doesn't mean they are not sensitive and proud of their country. Insults are taken seriously in the Philippines, so be careful when using sarcasm if you don't want to accidentally offend someone. If you receive a gift from a local on your Philippines holiday, don't open it right away since that's considered ill mannered. There is a fiesta going on in some Philippine city or barrio almost every day, usually in honor of a local patron saint. Each celebration represents a mixture of both pagan and Catholic traditions and is filled with music, dancing, and colorful street parades. Filipinos proudly celebrate the world's longest Christmas that officially starts on December 16. Actually, the Christmas season begins as early as September, with caroling and star-shaped lanterns lighting up the streets. Sinulog Festival, one of the country's most impressive and colorful fiestas, is held in honor of Santo Nino (infant Jesus) every January in Cebu City. The non-religious festivals are thematically grouped within different months, so plan your Philippines vacation accordingly. February and November are reserved for visual arts, music, dance, and theater. March is the sports festival month. July features a shopping festival, and September culinary celebrations. Nearly 170 languages are spoken in the Philippines, the official two being English and Filipino (Tagalog). People in the service industries speak fluent English, and even if you venture off the beaten path on your Philippines tours, you will always find someone who at least understands basic English phrases. Filipinos are very respectful towards elders, so when you're addressing someone older you might want to add the word "po" to the end of sentences--it's a sign of respect and a way to make your communication a bit more formal. Some useful phrases include "salamat po" (thank you), "pasensya na po" (excuse me/sorry), "tulong" (help). The phrase to learn when using public buses or jeepneys is "para," meaning "stop." The Philippines enjoy tropical weather that varies depending on the region, elevation, and season. The eastern parts of the archipelago receive most rainfall throughout the year and have no dry season. As you move west on you Philippines trip, you'll notice two seasons becoming more pronounced--the dry from December to May, and wet for the rest of the year. Summer monsoons bring rain to the entire archipelago between May and October, while winter monsoons bring cooler air sometimes causing drought (from November to February). Typhoons occur from July through October and are especially dangerous in Luzon, Bicol Region, and eastern Visayas. The coolest month is January, with temperatures averaging 25 C (77 F). May brings the warmest days, with the temperature often rising above 29 C (83 F). The most popular means of public transport remain the jeepneys flamboyantly colored like the G.I. jeeps American soldiers brought to the country during World War II. You can flag them down almost anywhere by simply shouting "Para!" (Stop). Tricycles (motorcycles with attached passenger sidecar) and pedicabs (a sort of rickshaws) are also common public transport vehicles that operate like taxis. Buses and vans are viable options when traveling between cities, but you should always first consider flying, since there are lots of budget-friendly domestic flights. Next to flying, boat rides remain the obvious choice when your Philippines itinerary includes island-hopping. Tipping is becoming more common in the Philippines, although it is not customarily expected. Some bars and restaurants include a service charge on their bills, taking the guesswork out of tipping. Generally speaking, if you don't see an additional charge on your bill, you can tip 10 percent of the total to reward good service and show your appreciation to the staff that waited on you.